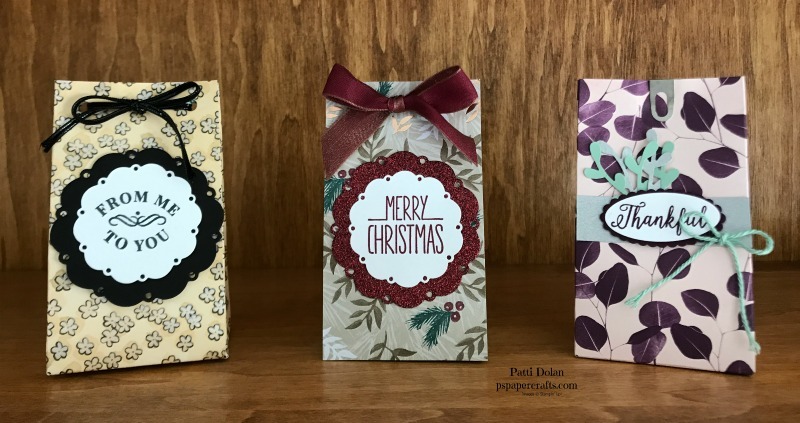 Using the Punch Board, you can make some alternative style gift bags. I have a couple of ways to do this; watch the video to see how to make a flip top bag and how to create a coordinating border at the top of the bag. 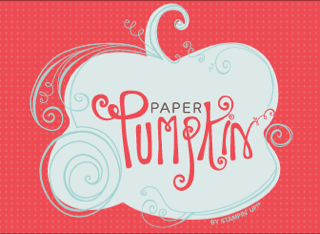 Isn’t this Designer Series Paper gorgeous? It’s called Petal Promenade. I just love flowers so this is right up my alley. Both bags start with a 10 x 8 piece of DSP. The light pink one has the label made with the Label Me Pretty Stamp Set and coordinating Pretty Label Punch. I used a 1 1/4” circle punch for the sentiment and stamped it with Mossy Meadow Ink. The bag on the right has some beautiful colors and the sentiment is from the Time For Tea Stamp Set. It was stamped with Fresh Fig and layered on a scalloped Fresh Fig scalloped circle. This is what the bag looks like when it’s open. You just flip it up and down to open and close. This bag is so darn cute. It’s made with the Animal Expedition DSP. The box is a small one that starts with a 10 x 8 piece of DSP and I scored the top at 1 1/2” and folded it down to get that great border at the top. It was closed with a Galvanized Clip. The sentiment is from Animal Outing Stamp Set was stamped in Call Me Clover Ink. Some Leaf Ribbon was adhered behind the Stitched Oval. The Punch Boards are so great to have on hand to make custom gift bags and envelopes. This week I’ll be featuring the Gift Bag Punch Board. The instructions are printed right on the punch board but I would suggest you practice on some scrap paper before using it on your good paper. You can make Small, Medium or Large bags and vary the height. It even has a place to punch holes at the top of your bag for ribbon. These are some samples from the catalog. These are some of the gift bags I’ve made recently. I’ll walk you through the process on a video tomorrow so come back to see. I’ll have some alternative projects as well this week. This is a great tool to have in your toolbox. To purchase the Gift Bag Punch Board, you can click on the product below and you’ll be brought to my Online Store. What a great sentiment! These are the things we hope for when it comes to our loved ones. 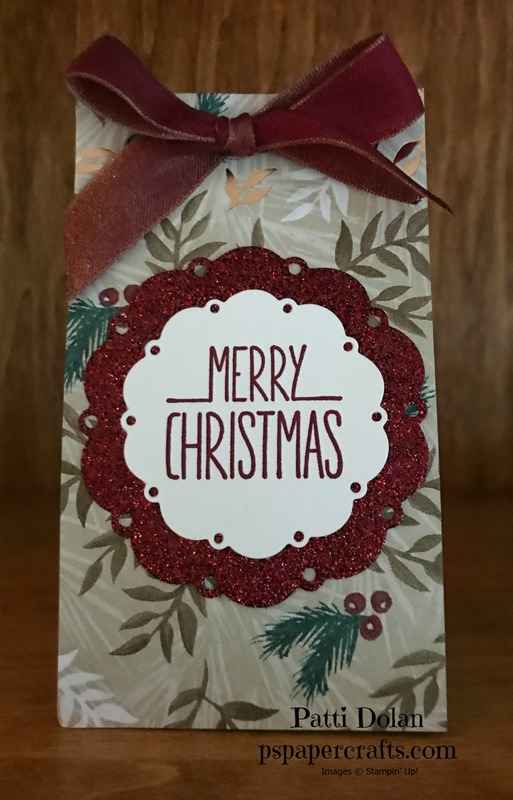 To create this card I used the All The Good Things Stamp Set, The Chicken Wire Elements, Stampin’ Write Markers in Calypso Coral, Crushed Curry, Pumpkin Pie and Old Olive. I added some Wink of Stella and Rhinestones. The card base is Old Olive and then the layer is the Chicken Wire Elements. I adhered it with Liquid Glue in the area behind the stamped layer to hide the glue. 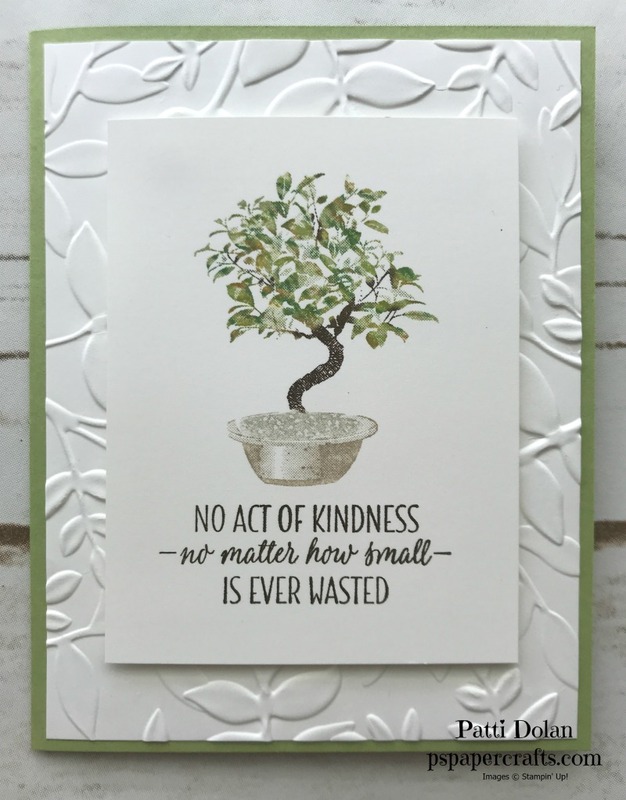 The image and sentiment were stamped on a piece of 3 x 4 Whisper White Cardstock and then layered on a piece of 3 1/8 x 4 1/8 Calypso Coral Cardstock. They way I got the color variation on the koi fish was to color it with Stampin’ Write Markers. I colored most of the fish with Calypso Coral and then added some Crushed Curry and Pumpkin Pie here and there. The sentiment was colored with an Old Olive marker. I breathed on the entire stamp before stamping to be sure it was moist. 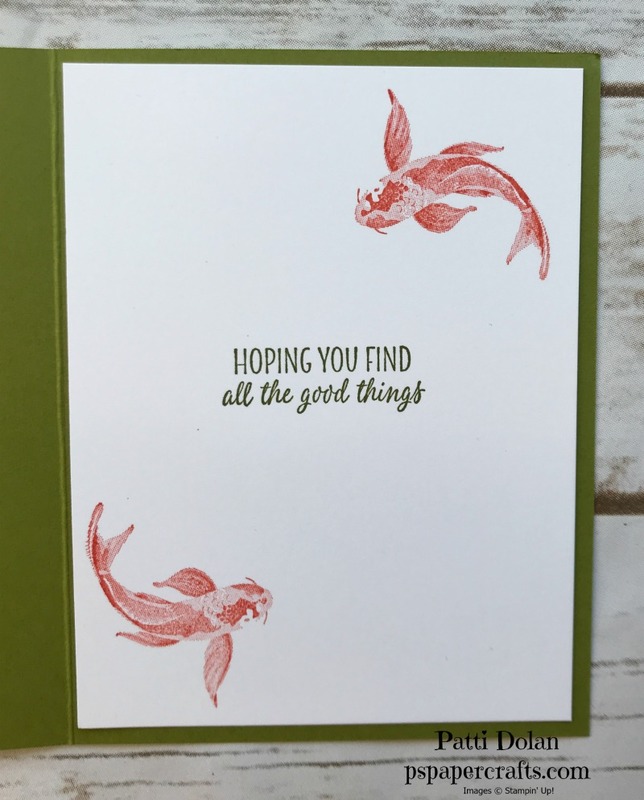 The koi fish on the inside were stamped with Calypso Coral and the sentiment in Old Olive. I just returned from my trip to Orlando for the Stampin’ Up! OnStage Convention. I had a wonderful time and met so many fellow stampers. 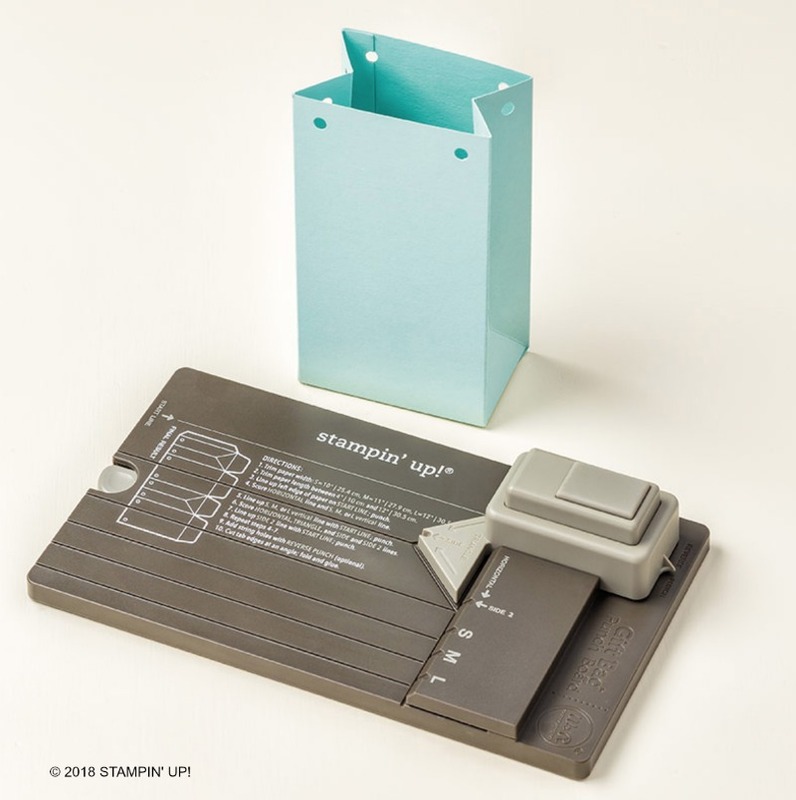 It is Stampin’ Up!’s 30th anniversary and they had 6,000 stampers at this convention. They really outdid themselves. I stayed with Debie (in the middle), who I met last year at OnStage at Salt Lake City and then I met Carrie (on the right) this year. These wonderful ladies were my roommates for the weekend. We had a great time together. Here’s some of my teammates. We had 13 of us in Orlando. My leader is Wendy, on the right in the first row. We were photo bombed by Kylie (just behind Wendy) who is the top demonstrator from Australia. It was so cool to meet people from all around the world and share the same passion. 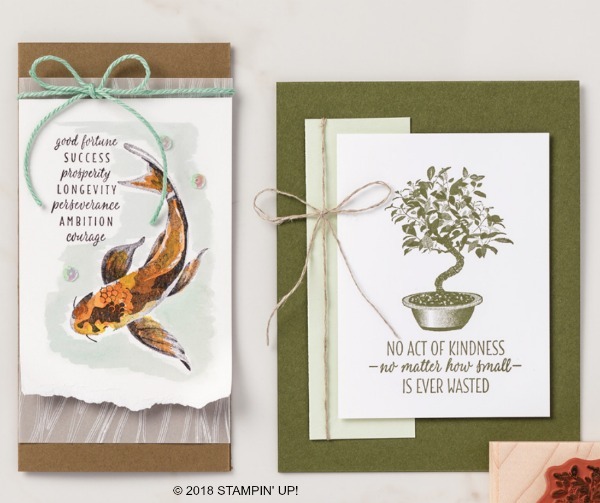 At OnStage, we get to see the new Occasions Catalog and Sale-A-Bration flyer, demonstrations on new products, get lots of FREE stuff, mingle with top demonstrators, hear from the Stampin’ Up! founder, CEO, Executives. There are awards and lots of other fun things. If you ever thought of signing up, let me know if you have questions. It’s something that I have really enjoyed and getting to go to OnStage has been a highlight of my year. AND I get to pre-order from the Occasions Catalog. Some of my favorite colors for Christmas are Cherry Cobbler, Crumb Cake and Early Espresso. This color combination is a little rustic which I love. Isn’t the script for the Merry Christmas sentiment is so pretty? All week I’m featuring the Merry Christmas to All Bundle and today I paired it with the Dashing Deer set. That deer is just beautiful! It’s stamped in Cherry Cobbler and then cut out with the coordinating die. 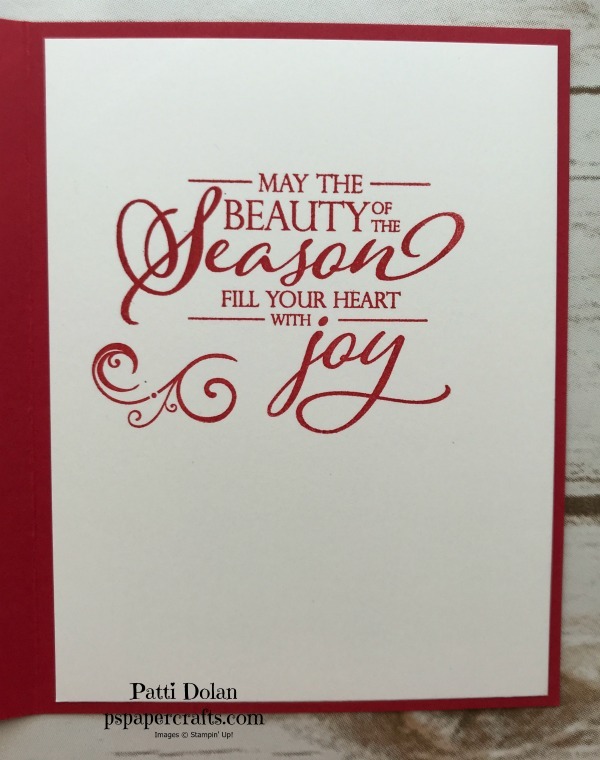 The card base is a half sheet of Cherry Cobbler cardstock which is scored at 4 1/4 to make a 5 1/2 x 4 1/4 card. The Crumb Cake layer is 5 1/4 x 4 and then I used a scrap of Very Vanilla to stamp the deer. 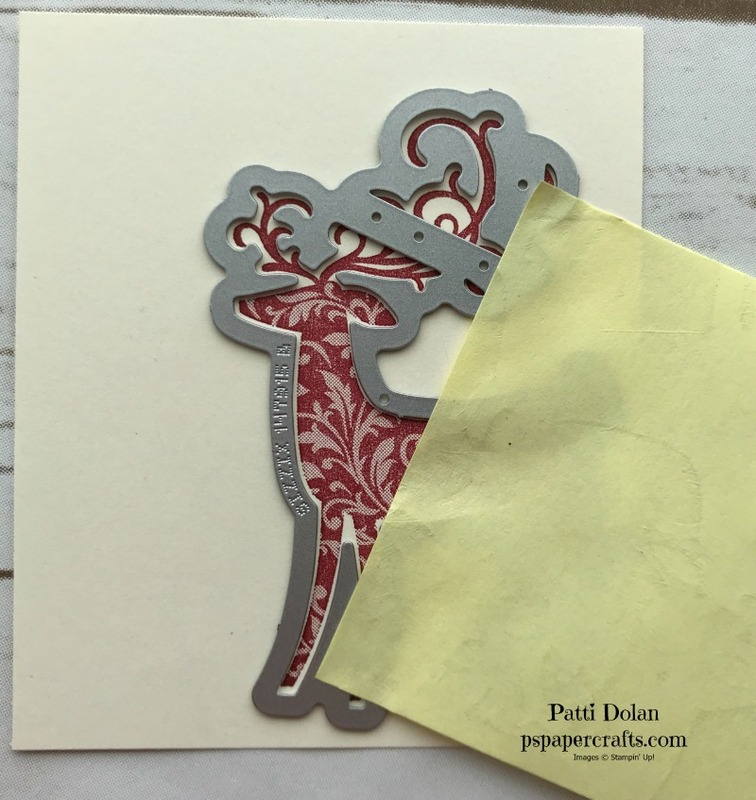 Here’s a quick tip for cutting the deer or really any die cutting. Use a Post-It Note to hold it in place before running it through your Big Shot. The bow was tied with 2 strands of Linen Thread. There’s a tiny pearl that I colored in Dark Cherry Cobbler with a Stampin’ Blend Marker. For the inside, I decided to use Crumb Cake to match the card front. Usually I use a piece of Whisper White or Very Vanilla but I like the way this came out. That sentiment is one of my favorites. It can be used outside or inside a card. These are the Products in the Snowflake Showcase. Hurry, they are only available until November 30 or while supplies last. Below are some samples made using these products. Aren’t they beautiful? 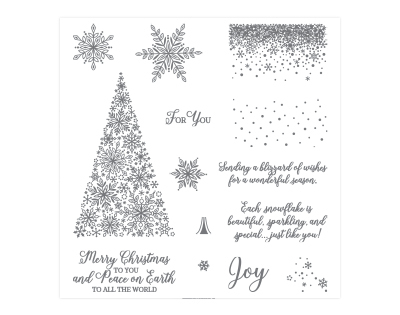 It seems like a natural fit to use the Subtle Embossing Folder with the Rooted In Nature Stamp Set to make a great masculine card. 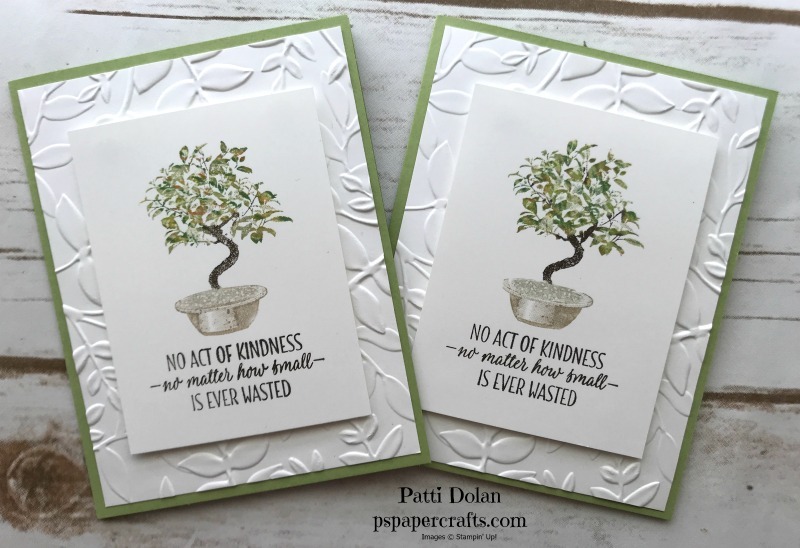 Can you see all the texture between the embossing folder and the tree that has multiple colors? 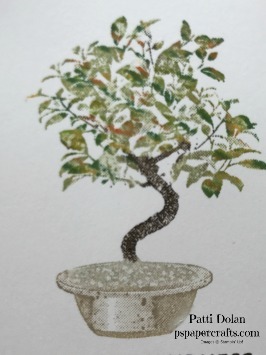 I colored the tree stamp with Stampin’ Write Markers and then stamped so you can see the brown branches and green leaves. 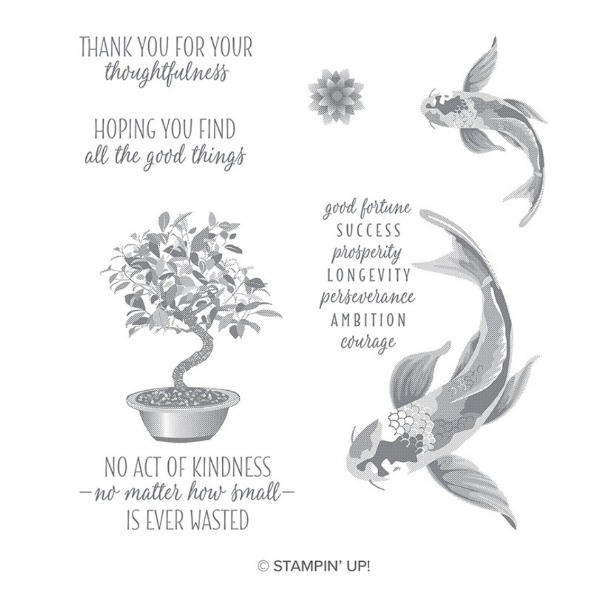 The birthday card uses the sentiment from the Perennial Birthday Stamp Set. I think this is perfect to give to a guy. You don’t need to add anything more; it’s simple and the colors rustic. This Praying for You card uses the sentiments from the Thoughts & Prayers Stamp Set which is retired. It’s one of my favorite for these types of cards so I’m holding on to it. 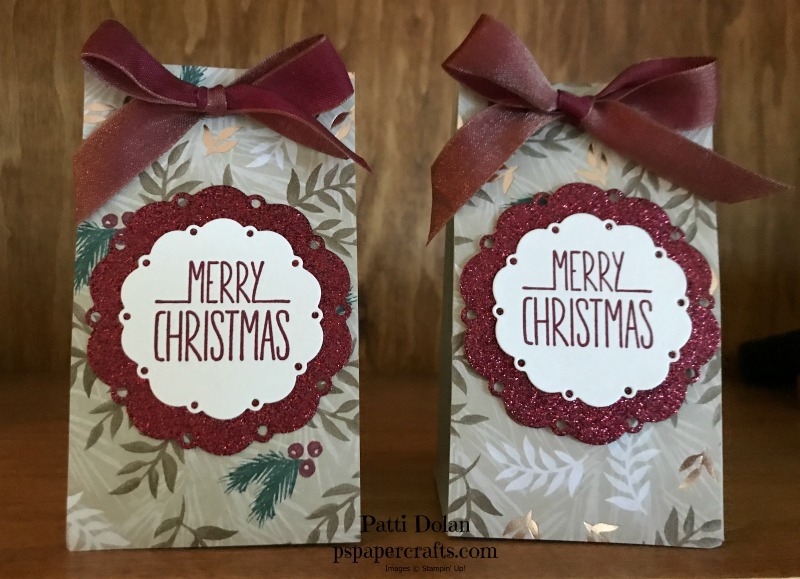 Watch the video to see how I did the embossing and the stamping with the markers. You can purchase the markers as a set. Early Espresso is in the Neutral set and Garden Green is in the Regals Set. You can just use any brown or green, just be sure it’s a water-based ink. It’s time to start making Christmas stuff. I figured I’d make some tags and thought that Subtle Embossing Folder would make a good base for the tags. Can you see the texture? It gives the tag a little more interest. I used that cute Cookie Cutter Christmas Stamp Set with the coordinating punch. This is in the annual catalog and I bought it last year and almost forgot I had it. Aren’t those images so darn cute? This sweet Eskimo tag was stamped in Memento Black and then punched out with the coordinating punch. I colored her with the Light Night of Navy, Light Crumbcake and Light and Dark Rich Razzleberry Stampin’ Blends. I then painted her fur with some Wink Of Stella for some sparkle. She was then adhered to a Stitched Oval with Dimensionals. The tag base is a 2 x 5 piece of Rich Razzleberry that was cut with the Scalloped Tag Topper and Triple Banner Punches. I then ran it through the Big Shot with the Subtle Dynamic Textured Impressions Embossing Folder. 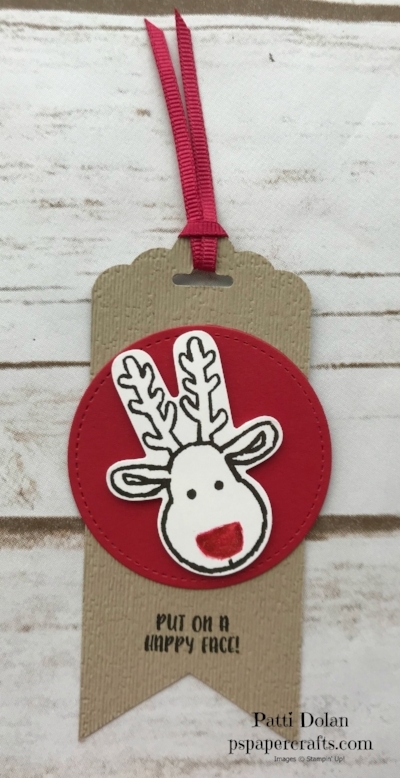 The Rudolph tag was stamped in Early Espresso. I wiped the nose off before stamping and then colored in Real Red. I added some Wink Of Stella to the nose to make it shine. He’s adhered with Dimensionals to a Real Red Stitched Circle a little crooked to make it more fun. 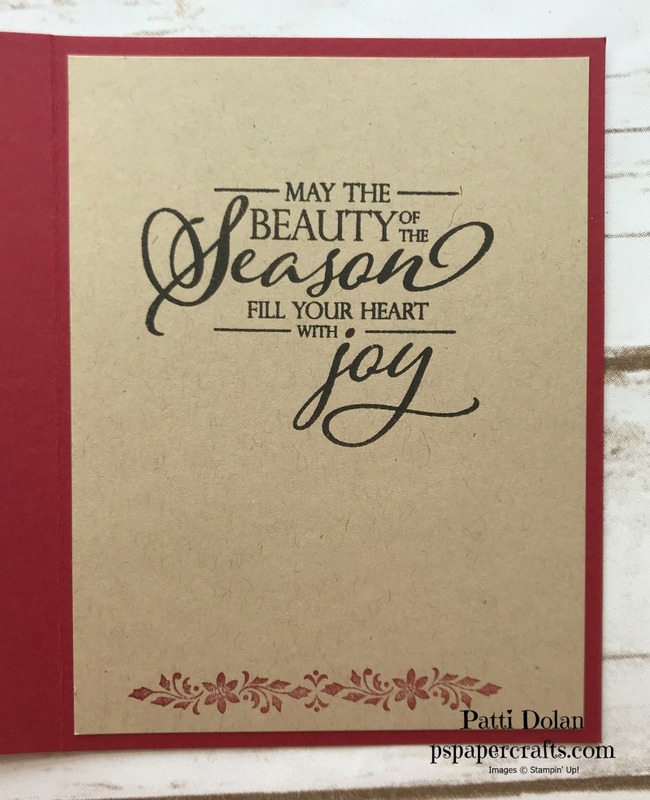 Don’t you just love how an Embossing Folder adds great texture to a card? It’s so simple but really makes a big impact. This week I’ll be using the Subtle 3D Dynamic Textured Impressions Embossing Folder. It doesn’t look like it does much in the catalog but it’s so pretty. 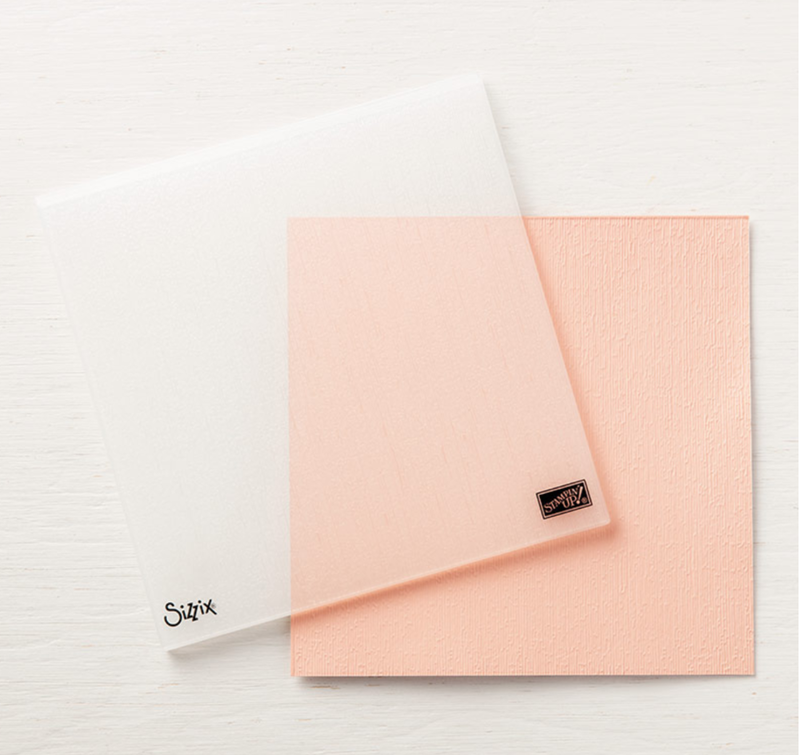 It gives your cardstock a textured look; it looks like linen. 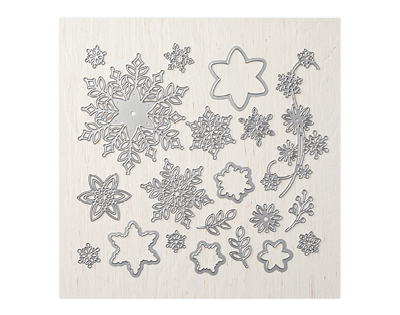 Below are some cute cards from the catalog using this embossing folder. Look at the texture layer to see the results. Keep checking in to see how I use this folder. Here’s the link to purchase from my Online Store if you’d like to get one. Continuing with the Buffalo Check Background Stamp, I decided to make some baby cards; a cute little bear card for a boy and a sweet elephant card for a girl. The blue card was stamped with the Buffalo Check Stamp in Balmy Blue on Balmy Blue Cardstock and then layered on a Pacific Point card base. The pink card was stamped with the Buffalo Check Stamp in Gray Granite on Petal Pink Cardstock and then layered on a Gray Granite card base. What a great combination for baby cards! Take a closer look at the boy card. 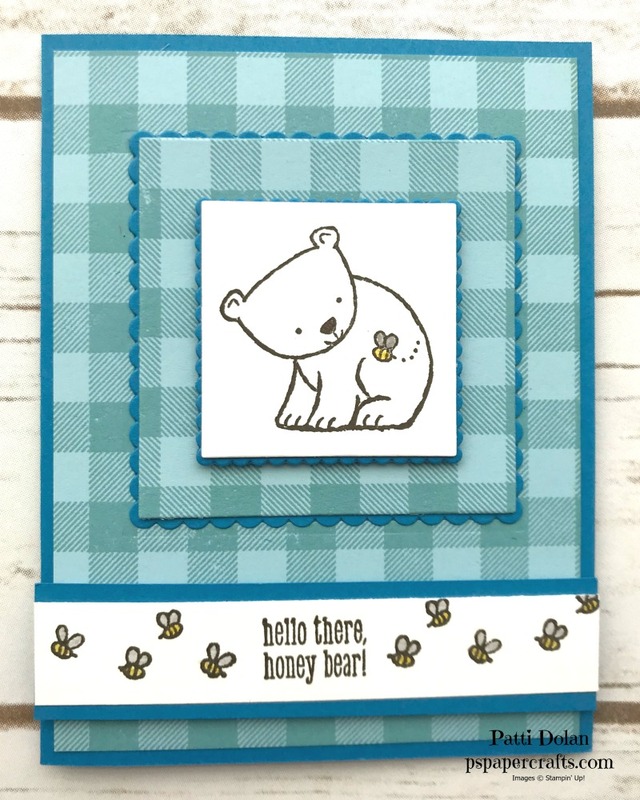 I stamped that cute little bear in Early Espresso and cut it out with one of the smaller Layering Squares Framelits. I chose the size after stamping him. The bees are colored with Pineapple Punch and Smokey Slate markers. I layered him up on a Pacific Point Scalloped Square and then a square of the plaid piece. That’s all layered on another Scalloped Square and adhered to the card. (TIP: I cut the plaid square out of the plaid layer and then it’s covered by the Scalloped Square). The strip for the sentiment is 3/4 x 4 1/4 and its layered on a Pacific Point strip that’s 1” x 4 1/4. I added some Clear Wink Of Stella to the bees and their wings. For the sweet little elephant, I stamped her in Smoky Slate on a piece of 2” x 3” Whisper White Cardstock. The grass was stamped in Soft Sea Foam and then the flowers and her toe-nails are colored in Petal Pink. The Petal Pink layer is 2 1/4 x 3 1/8 an the Smoky Slate layer is 2 1/2 x 3 3/8. All of these layers are adhered to the 5 1/4 x 4 Plaid Layer using Dimensionals. The final touch was to paint her toenails with Wink Of Stella and the flower petals as well. I added some Pearls which were also colored in the Petal Pink Stampin’ Blends. A girl’s gotta have some shine!!! 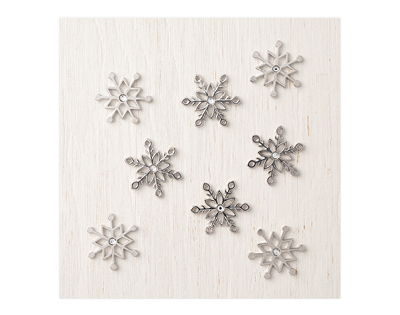 This Spirited Snowman Stamp Set is so darn cute; I love it! Today I made a card using it along with the Buffalo Check Stamp. Who would have thought that Pool Party and Coastal Cabana would make such a fun background. The snowman was stamped in Black Memento Ink and colored with Stampin’ Blends. I added some snowflakes using Pool Party Ink. The snowman was stamped on the largest oval from the and the sentiment in the smallest oval from the Stitched Shapes Framelits. Then I layered them on the largest and smallest scalloped oval from the Layering Oval Framelits cut from Coastal Cabana Cardstock. In the video, you’ll see how I used the Stamparatus to stamp the background using the Buffalo Check Stamp. I inked it in Coastal Cabana and stamped on a 5 1/4 x 4 piece of Pool Party Cardstock. Tip of the Week Buffalo Check with Stamparatus! This week I’m focusing on the Buffalo Check Stamp which is a really great background stamp. I recommend you get the Clear Mount and use it with the Stamparatus. My Tip is to put some washi tape where the edge of the cardstock would lay so you can keep its placement on the Stamparatus. See how I have it stuck on along the edge of the Pool Party Cardstock? Ink up the stamp. I like to put the stamp case under the plate to help keep it flat when inking it up. Flip the plate to stamp. Re-ink again and again if needed to get good coverage. This works really well and helps you get the coverage you need. Here are a couple of Christmas Cards I made with the Buffalo Check Stamp. Don’t you love how this plaid background looks on these cards? 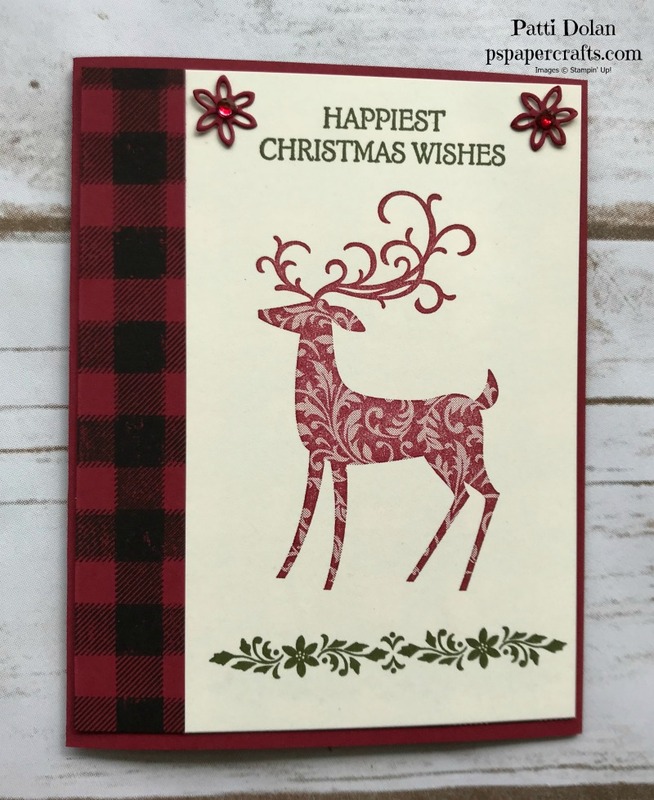 This card has a Whisper White layer with the Buffalo Check stamped in Shaded Spruce. 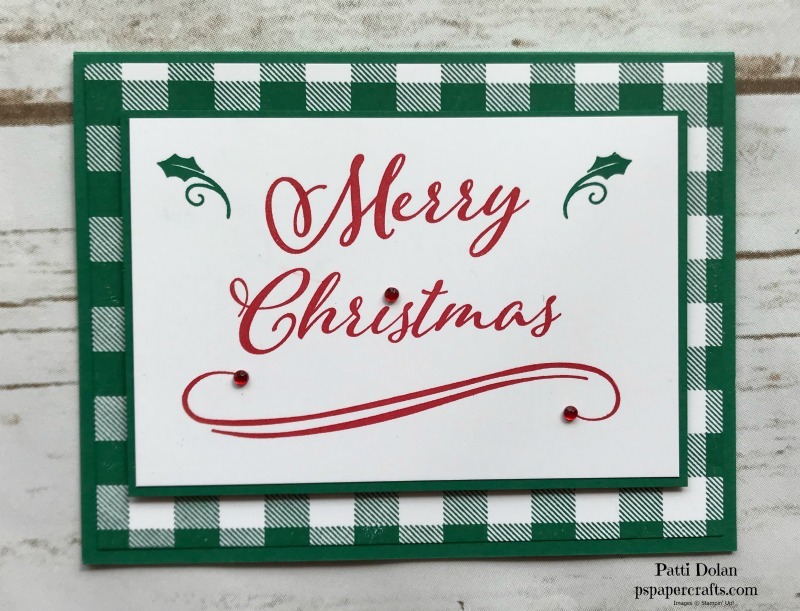 The Merry Christmas sentiment is stamped in Real Red and is from the Merry Christmas To All Stamp Set. A couple of Red Rhinestones just give a little bling to the card. This card has a Cherry Cobble card base and a strip of Cherry Cobbler with Early Espresso stamped on it using the Buffalo Check Stamp. The sentiment and floral image was stamped in Mossy Meadow and the Deer is in Cherry Cobbler. These all came from the Dashing Deer Stamp Set. I cut out a couple of flowers from the coordinating dies and colored a couple of clear rhinestones with a Cherry Cobbler Dark Stampin’ Blend.